Often I hear “our world is getting smaller”. When people say that; they are referring to the ease of travel or transportation. How about food and flavor? When I visited Italy 10 years ago, a very popular confection & beverage flavor was forest fruits. Forest flavors is portrayed with pictures of blackberries, blueberries and raspberries and is always somewhat floral. 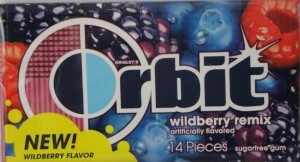 My first impression of the Orbit wildberry remix is that it’s forest fruits flavor from Europe. When I opened the packaged and smelled the gum, though, I changed my mind. 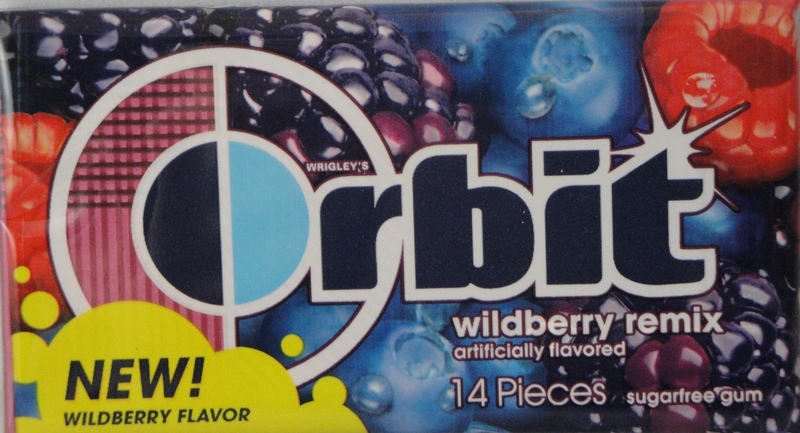 Orbit Wildberry Remix smells just like grape soda or grape candy flavor for kids. Initially, the gum was juicy, sweet and flavorful. It reminded me of a berry flavored Starburst, and I love Starbursts. Within 45 seconds of the first chew, though, I was unhappy. The sour juciness of the gum wore out and the flavor became a strongly floral blueberry/berry mix: very European. The cool sensation of the gum came on about 1 minute into the chew and was awkward, but refreshing. It was awkward because the coolness seemed to make the fruity flavor seem medicinal; like cough syrup. At 7 minutes into the chew, I was happy again. The flavor seemed more like raspberry and seedy. There were some slight floral notes lingering and those lasted the rest of the chew (18 minutes). The gum had long-lasting floral berry flavor and coolness. I bought this gum for my kids to chew on a recent flight we took. My 8 year old daughter didn’t want the “berry” gum twice and specifically asked for mint on the return flight. Orbit Wildberry Remix flavor is not be for everyone and for that reason I’d have to say it’s just ordinary. I can assume that some people may not like this gum because it would remind them of cough syrup from their childhood (fruit flavor plus coolness). I’m curious to hear others opinions.